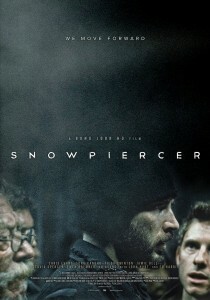 If you’re a fan of film, especially science fiction and film, you may have heard of this low budget “art” film, Snowpiercer. Describing it as an art film may insinuate this dystopian action-suspense film carries with it an air of pretension, but give me a moment here. Based on a French graphic novel, a South Korean director assuming the big chair, and featuring an international cast including Chris Evans, Jamie Bell, Tilda Swinton, John Hurt, Kang-ho Song, and Ah-sung Ko, Snowpiercer could be one of the most outstanding films of the year. Terrifying, daring, and compelling, this stunning work of science fiction, hailed by critics and science fiction fans, was initially released in eight theatres. Yes. Eight. As in, not ten.